“Born in Lambeth in 1923, Vera joined Halas & Batchelor in 1940 fresh out of art school. Her talents and need to express them quickly moved her from tracing work – copying the pencil drawings of others onto clear cels in ink – to animating herself. She remained a key member of the company in its founding years, before leaving to join the Larkins Studio in the late 40s. Vera flourished at Larkins, working particularly well with Nancy Hanna who was already established there and the two were head-hunted to work in an animation department at Pearl & Dean under ex-UPA man Dave Hilberman in 1953 or 54. Hildenburg’s tenure at Pearl & Dean was unfortunately short-lived and Nancy and Vera were not treated well by the management thereafter. 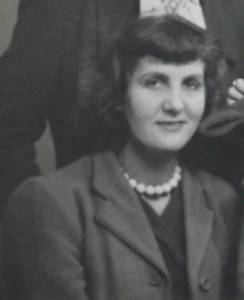 They both moved to join Bob Godfrey and Keith Learner at Biographic in 1957, and remained key a fixture of the British animation industry there until she retired in 1985.